Scottish football agent Scott McGarvey insists Sam Allardyce losing his job as England manager over a newspaper sting was an over-reaction by the Football Association. Allardyce’s reign as England boss lasted just 67 days after undercover Daily Telegraph journalists posing as businessmen filmed him arranging to earn extra money by doing motivational speeches for a bogus Far East firm. The former West Ham and Sunderland boss was also caught on camera mocking Roy Hodgson, revealing how to bypass FA transfer rules and criticising his employers and as a result he lost his job after both parties agreed he could not carry on. 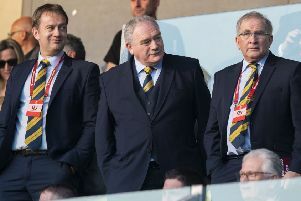 Allardyce attended the meeting at a hotel in London after it was arranged by former Scotland Under-21 and Manchester United forward McGarvey, who admits that Allardyce should hold him responsible for how events unfolded. Asked on Sky Sports News how he felt about Allardyce losing his job, McGarvey, who has known the 61-year-old since their playing days in the 1980s, said: “Very surprised. I’m devastated for him. I can’t think of anything worse that could have happened. “He’s never once spoken about money. He’s never once said anything about money. It was only, ‘Are you okay, lad? I’ll help you’. “I can understand if he doesn’t speak to me again. I need to respect that, but I hope not because we go back a long way. It might take a bit of time because I know how hurt he is at losing the England job. McGarvey, 53, who is also implicated in similar stings on QPR manager Jimmy Floyd Hasselbaink and Southampton assistant Eric Black, insists that they were entrapped with a “capital E” by the national newspaper. He also claims that when he first started talking to the undercover journalists, Allardyce was still at Sunderland. “Capital E. Absolutely. One hundred per cent,” he added. “This is not Monday to Friday. This is 13 weeks of dozens of emails, hundreds of texts, hundreds of calls and bringing more than seven or eight innocent people into this story.